Terra cotta plate before firing. This plate has been painted in places with underglaze and the scribed with various tools. 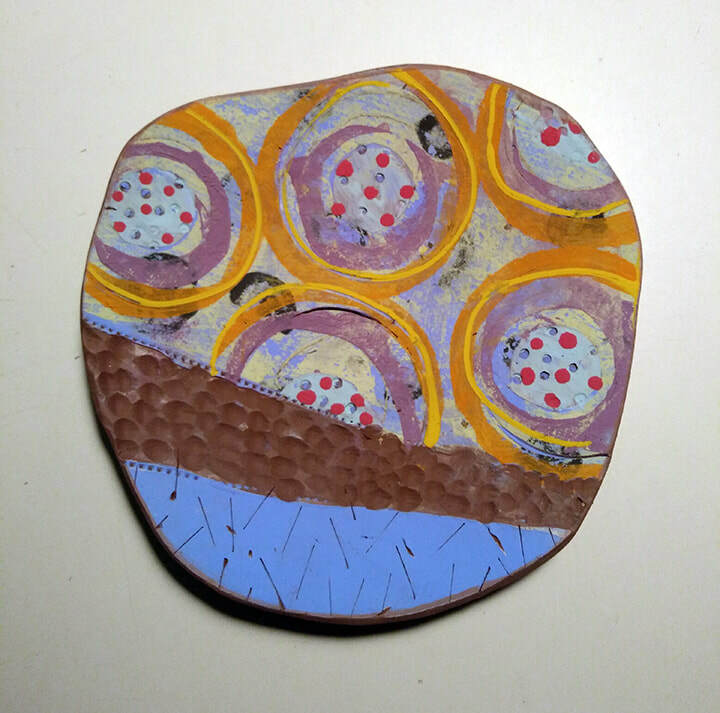 The circular patterns were achieved through underglaze transfers and stencils. I'm just beginning to experiment with this approach. I am finding it very exciting. This will change in appearance after it is fired. Keep posted. I grew up in Indiana, spent some time in Western Kentucky, the Low Country of South Carolina and Key West before calling the Treasure Coast my home. I’m appreciative of the interest and support that the residents of the Treasure Coast have for the arts. With a BFA in printmaking, I 'm now exploring the possibilities of combining that with the medium of clay.. I’ve been working in clay for about 6 years and have found that it is easy to carry one’s imagery and style from medium to medium. The tactile nature of clay immediately engages my senses and involves me creatively. One can’t be passive when ones hands are deep in mud! I also enjoy collaboration as it nurtures a strong creative environment and builds lasting alliances in the art community. ​I’ve been hooked on the creative process for as long as I can remember. I enjoy the surprise of where it takes me. My desire is to share this delight.erview.